Tomita Yuri has hated boys since she was little, seeing them as the devils who taunt and tease her. So when her all-girl school Kinka academy decides to merge with the Ginka academy for boys, her ‘heaven’ is once again threatened by the devils from hell = men. Not only that, but being a member of the student council, she now has to work alongside the male student council of Ginka academy. Will Yuri’s ‘heaven’ be overrun by the male devils from hell? I love stories where heroines aren't completely moe about boys right off the start, but circumstances and certain character interactions slowly change her mind and she surmises that maybe there is goodness in the world after all. But I absolutely cannot stand when this happens solely for plot's sake, without proper segues or situations justifying this attitude reversal. Well, this story did not disappoint, though it certainly isn't one of the top ten in its genre. Enter Tomita, who due to mild childhood traumas, dislikes boys and knows they're generally up to no good. She's the student council president of an all girls school, which frankly in my opinion is painted really really well! All classmates seem to have extremely funny contributions to the overall estrogen replete atmosphere and her freind and vice president Tudou certainly adds flair to the storyline as the beloved prince character of their school who easily charms any girl with her host like demeanour. Obviously, this blissful existance that Tomita holds onto so dearly will be submerged in chaos when her school merges with an all boy's school. But what can she do to alleviate the suffering? And why won't the male student council president Yuuki from that school stop trying to change her mind about boys?! What's in it for him? Hmm... It's clear where this plot is leading, but its execution is done tenderly, so as not to leave any disgruntled readers. I think character development in this story is taken at a slow pace and therefore shines through in ever chapter. Most characters are quite unique even though each somewhat resembles standard shoujo protocol for a hate-grows-into-love plotline. The artwork is commendable because all characters look true to their personalities and very attractive at the same time, though not submitting to any common sensibility of wha constitutes good looking. Each character is given sufficient space to air his grievances in life as well as develop as an individual. Scenes are done humourously when the situation demands it, and tender when intimacy is warranted. Some of the plots seem hackneyed, especially those revolving around Tomita and Yuuki, but those centering on Tudou and Himeno completely make up for the former in originality as well as entertainment. Once or twice, your nostrils may flare regarding how easily the lead female is relegated to an inferior position in a race for presidency, but sadly such plots are to be expected in shoujo nowadays. Overall, this is a short read, but a suitable one if you're looking for comedy and high school plots, but falls short of being a great romantic read because the characters just aren't meaty enough for that. Situations and dialogue are relatively novel and keep you laughing, while the art is soothing and a feast for those who enjoy delicately drawn bishounen. Story: The plot is strange and fast! The first main couple gets together in just a few pages. And the second fall in love over something ... stupid. Personally I'm not a believer in 'love at first sight'. But if you are maybe you'll appreciate the story more than I do. Basically this manga's really like a GAG. It's a oneshot plot-line and is best read when you just want to pass the time with a simple romantic tale. Artwork: The artwork is very typical shoujo style. The girls range from adorable to strong personalities. The guys (of course) are all attractive. But even though it's typical style the endearing situations the two main couples get into together are heartwarming. Or they'll make you smile. 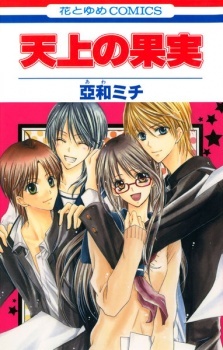 Characters: With a plot like Tenjou no Kajitsu your characters are very limited. There isn't enough room for much development. The main characters sudden switch to hating boys for most of her life to suddenly falling in love with the first one to be kind to her is fast-pace development. Something that I personally don't like, but to each his own. Overall: This manga is good in some sort of way, but certainly can't hold a candle to other more popular, more developed shoujo comics.